Many arrhythmia patients are unable to undergo conventional invasive therapies. Using non-invasive radiosurgical ablation, our goal is to further the science for this potential therapeutic alternative. The Cureus Journal of Medical Science is collaborating with CyberHeart Incorporated to inspire continued study and knowledge sharing highlighting the investigational use of stereotactic radiosurgery for the potential non-invasive treatment of cardiac arrhythmias. Together they have launched a medical publishing competition that incentivizes clinicians to submit original research analyzing cardiac radiobiology and trial-patient case studies documenting clinical rationale, details and outcomes. Today more than 14 million people in the United States experience some type of cardiac arrhythmia. For older persons with a history of heart disease, arrhythmia can lead to serious medical complications. With proper treatment, many continue to live full, healthy lives. Some arrhythmias are effectively treated with catheter ablation (CA), however, many patients fail or cannot undergo CA due to target inaccessibility or patient comorbidities. Non-invasive stereotactic radiosurgery is being investigated for safety and effectiveness in treating such conditions. In limited feasibility clinical trials, preliminary outcomes under an IRB / FDA-approved trial have observed early positive subject outcomes with no procedural complications. Investigational studies are ongoing. Led by an independent team of domain experts, all submissions will be peer-reviewed prior to Cureus publication. Peer reviewers include Dr. Bill Loo, radiation oncologist at Stanford University Medical Center, Dr. Douglas Wong, radiation oncologist at Fresno Community Regional Medical Center, Dr. Paul Zei, electrophysiologist at Stanford University Medical Center, Georg Weidlich, PhD, professor of biomedical physics at California State University Fresno, Dr. Arjun Sharma, vice president of medical safety at Boston Scientific, Steven Axelrod PhD, physicist and CEO at G-Tech Medical, and others. Following publication, all articles will be made accessible for search and free full-article download via PubMed Central - the National Institute of Health (NIH) hosted digital search engine for full-text biomedical literature. A $3,000 USD monetary prize will be awarded to the article author who receives the highest Cureus SIQ (Scholarly Impact Quotient) score. SIQ is Cureus’ unique crowdsourced post-publication review that allows the clinical community-at-large to assess and score published medical literature. Reviewers can assign scores on article criteria including study design and methods, clarity and rationale, novelty of conclusions, etc. Article submission is entirely free. Eligible articles must be submitted for editorial and peer review by Wednesday, June 1, 2016. 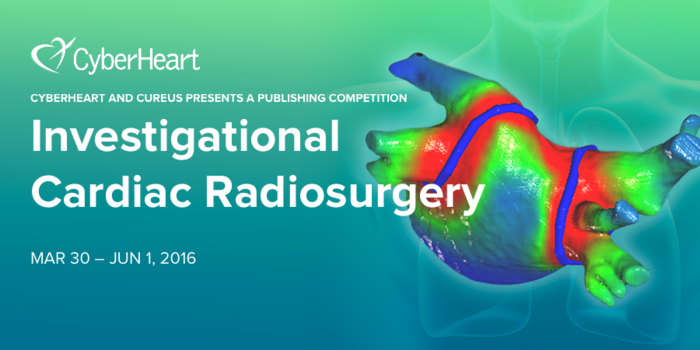 More information regarding this publishing competition and related submission stipulations can be found at http://www.cureus.com/competitions/ch-cardiacradiosurgery. The Cureus Journal of Medical Science is a no-cost, peer-reviewed online medical publishing platform leveraging a unique crowdsourced post-publication review process. Relying on the collective intelligence of its clinical community, Cureus enables faster publication, greater access, and ultimately, better research. Visit http://www.cureus.com for more information. CyberHeart Incorporated is an early-stage, venture capital-backed medical device company. CyberHeart is developing the first non-invasive robotic ablation treatment for cardiac arrhythmias, such as atrial fibrillation or ventricular tachycardia. The company began operations in 2006 and has been conducting pre-clinical studies that validate the feasibility of the technology.